Visual play | Children's development | KaBOOM! Play is greatly affected by the visual environment. Playspaces feel fun and ready for action when walls and equipment are freshly painted with bright, but not over-stimulating, colors. Large, easy-to-read signs help everyone to find their way around the playspace. Using steps with alternating, contrasting colors helps children gauge the change of surface heights and maneuver around them more easily. Parents and kids feel safe and comfortable if toys and equipment are clean and ordered (this is a visual cue that the environment is well cared for and maintained). Children also develop their visual sense through play. They refine their coordination and learn cause and effect as they explore movement, play with lights, and mix paint colors. Describing one's environment to others is great practice for reading, writing, and creative arts. Inspire visual play by including lots of artwork on the walls. 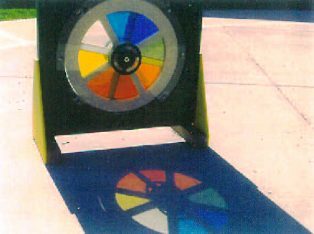 Provide visually intriguing play objects, like mobiles and funhouse mirrors. Encourage children to leave their mark in an art area. Imagine your playspace as it looks to a child. Children seek visually appealing environments, just like adults do. Picture everything from the perspective of someone much smaller or who is seeing the objects for the first time. Is artwork hanging on the wall visible to children? Is the room under- or over-stimulating? Using visual cues will allow children who are nonverbal, or who do not yet read, to better direct their activities. They may not be able to see a sign that reads "art area," but they know that a large paintbrush mural near the entrance indicates this is where art happens.